There are many reasons to choose La Trobe University for your graduate research degree. You will be attending one of Australia's leading research universities and gain access to our world-class research centres and institutes and state-of-the-art facilities and infrastructure. You can join one of our cutting-edge interdisciplinary Research Focus Areas and contribute to developing insightful, pragmatic and impactful responses to the fundamental challenges facing modern society. You will gain opportunities to work with industry, undertake an internship or be partnered with an industry mentor in order to gain invaluable real-world experience that will support you in converting your academic success into a rewarding career. You will be enriched by a vast array of professional development opportunities, including across intellectual property, commercialisation and entrepreneurship, media and social media engagement, research publication, funding and communication, experience in academic teaching, and more. Our RFAs Address the questions for future human societies and environments. Our candidates are high achievers with a passion for research. Hear first hand about their experiences. Find out about the great facilities we provide to support your graduate research project. The Graduate Research School has partnered with AMSI Intern and IMNIS to provide opportunities for you as a graduate researcher to gain professional experience during your candidature. 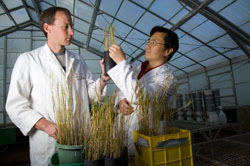 La Trobe provides a supportive culture for graduate research candidates.